Winter Activities for Families in Washington, D.C. Even when the weather is cold and damp, there are plenty of interesting activities in the Capital Region to keep the whole family entertained. If you're looking for some ideas for winter family fun in the Washington, D.C. area, there are plenty of things to do that appropriate for all ages. Average temperatures in January and February are usually in the 30s and 40s, and while the region does get an occasional snowfall, the ground is relatively dry for most of the winter. As a result, the winter season is often the best time to visit some of the Washington, D.C.'s top attractions as they tend to be less crowded than other times of the year. The Washington, D.C. area has a wonderful variety of museums. Many of the city's most popular museums are clustered together on the National Mall, so you can easily visit more than one on the same day. The Smithsonian Museums cover a wide range of topics and include a variety of hands-on activities that are especially appealing to kids. Additionally, some of the smaller museums across the region—including the Bureau of Engraving and Printing, Mount Vernon Estate and Gardens, and the KID Museum—offer great programs for the whole family. Take the whole family ice skating or roller skating at a rink in Washington, D.C., Maryland, or Virginia; there are even a few special places to ice skate outdoors in the nation's capital. Skating classes and hockey teams will keep kids and adults active throughout the winter season, and open-skate times at most rinks are a great opportunity for the whole family to get out on the ice. Among the top-rated rinks in the area, you can check out the Sculpture Garden Ice Rink at 7th Street and Constitution Avenue in D.C. at the National Gallery of Art Sculpture Garden, which is one of the most popular winter destinations in the region. 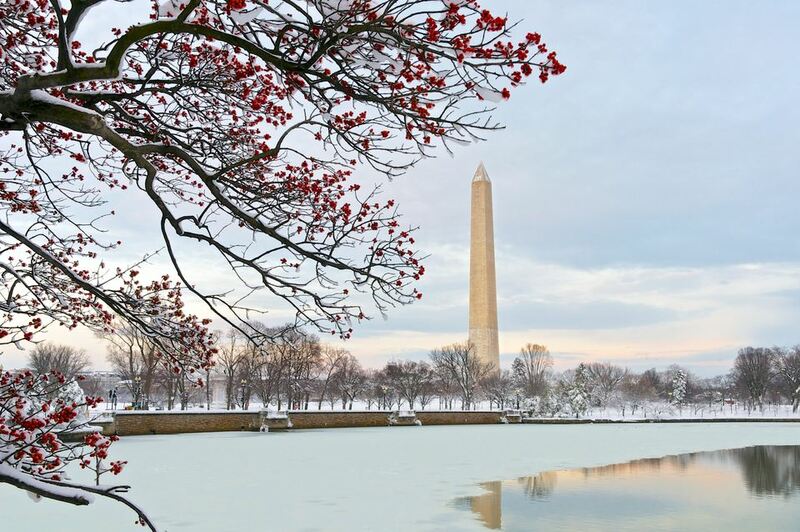 During the winter months, take a sightseeing tour of Washington, D.C. and explore the city by bus or trolley. By taking this form of transit, you can enjoy the benefits of hopping on and off (stay warm and dry while you ride around) while you learn about the district's historic landmarks. The Big Bus Washington, D.C. offers one such tour in either a one- or two-day travel option. This comprehensive network of bus routes lets you take in over 40 spots across the city in an open-top bus as a tour guide directs guests' attention to the various sights and attractions of the nation's capital. On a cold or rainy (or snowy) day, kids in the Washington, D.C. area can have a blast romping around at indoor playgrounds and amusement centers like Kidville in Bethesda, Maryland. Family fun centers offer attractions like go-karts, mini-golf, laser tag, ropes courses, moon bounces, paintball rinks, arcade games, and carousels; these destinations are especially great for young families. Although there are plenty of regular theatres in the capital region that also feature a full line-up of holiday shows appropriate for the whole family, you can make a special day out of your trip to Virginia, Maryland, or D.C. by catching a performance at a theatre made especially for kids. The capital region is a prime destination for performing, visual, and arts education programs like those at Imagination Stage in Bethesda, Maryland. Other great places to catch some live kids' entertainment include the Kennedy Center for the Performing Arts in D.C., Wolf Trap National Park for the Performing Arts in Vienna, Virginia, the Adventure Theatre and The Puppet Company in Glen Echo, Maryland, and the Encore Stage and Studio. You can attend the best events of the season with great food, music, and live entertainment for the whole family all winter long. From festive Christmas performances and concerts in December to celebrations of the end of the season in March, there's no shortage of special events this time of year. December in Washington, D.C. means you'll have your pick of holiday shows and concerts while January brings things like Martin Luther King, Jr. and New Year's Eve events. In February, experience Washington, D.C.'s Restaurant Week or attend a Wizards basketball game, and in March you can enjoy seasonal events like the St. Patrick Day parade and the National Cherry Blossom Festival. Winter is a great time to go to the movies, and you can find a convenient movie theater in Washington, D.C., Maryland, or Virginia to enjoy the latest films. If you're looking for something a little different, consider a visit to the historic, single-screen Uptown Theater in the Cleveland Park neighborhood of Washington, D.C., which is one of the oldest movie theatres in the region. Take the kids to a ski resort for a day of family fun in the snow. There are several ski areas like the Whitetail Ski Resort in Mercersburg, Pennsylvania, that offer skiing, snowboarding, and snow tubing within a few hours drive from Washington, D.C. The Bryce Mountain Resort in Basye, Virginia, is another popular destination nearby (just two hours from D.C.) that offers skiing, snowboarding, racing events, and private lessons for the whole family. Plus its location near the Shenandoah National Park, which offers a whole host of recreational activities and historical sites, makes it an ideal home base for further exploration of the countryside. On a snowy day, you can also find some great places to go sledding in Washington D.C., Maryland, and Northern Virginia—just be sure to avoid the Capitol. Sledding on the grounds of the Capitol is prohibited, and U.S. Capitol Police are known for ensuring the rules are followed. You and your family can spend the day shopping in one of the district's best shopping neighborhoods like historic Georgetown or finding some bargains at an outlet shopping center in the Capital Region. Alternatively, you can spend some time browsing in the museum gift shops in Washington, D.C. to find unique items such as books, clothing, jewelry, videos, crafts, decorative arts, toys, and more.